Terry Hope Romero is a wonder and a wizard. 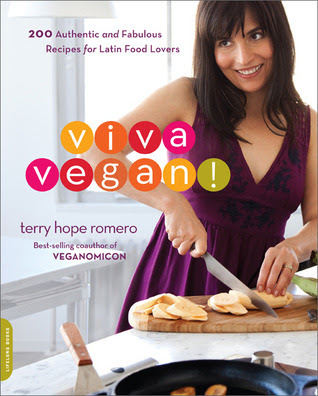 This really fabulous cookbook makes it possible for everyone to eat really spectacular Latin food with gusto. It is inconceivable that anyone would miss eating animals when served food like this. I have too many favorites from her offerings, but I came across a freezer full of hominy once and worked my way through the posoles, seitans, sofritos, pot pies...all incredibly flavorful and unusual. This book contains many regional variations on your favorite bean dishes: Venezuela-style Black Beans, Red Beans with Dominican-style Sazón, Brazilian Black Bean Stew with Portobello Mushrooms...it goes on. Terry has given us Enchiladas, Empanadas, Sopes, Tamales, Pupusas, Tostadas, Flan. There are no burrito recipes in this book! Well, she does tell us what usually goes in a burrito but we kind of knew that. You'll know to be creative when you combine parts of other recipes to create a truly extra special burrito-wrap. But she even is otherworldly when she is creating Tacos. I mean, this is creation on it's forward-most edge. I MUST buy a tortilla maker. Somehow food like this demands attention to details like fresh tortillas. You will be happy, and full, and wondered how you managed without it, I promise you. The Europa Challenge Blog: Giveaway! Everything Happens Today, by Jesse Brown...: Europa Editions is offering a finished copy of Everything Happens Today , by Jesse Browner, coming out in October. The giveaway will be open until September 28, 2011 and is open to readers in the United States and Canada. Click on the hyperlink above to enter. Author Jesse Browner's website has a short description of the book, along with blurbs from reviewers. Europa Editions has also posted a listing of Browner's book with a description. At Europa Editions' website you may access all their title listings, and add to your TBR list. Perhaps it is not so strange in this day and age to want to have time alone to think about the world and one’s place in it. It may be necessary to first take that step away to appreciate the benefits of solitude. Some of us imagine we would revel in it, but surely one must also have a sense of loss—a sense of disconnectedness and of strangeness with the world. Perhaps this sense of being apart is the treasured thing. Philip Connors has written a curious memoir about his years (must be close to ten at the time of this writing) 10,000 ft above sea level in New Mexico’s Gila National Forest from spring until fall, watching for fire. He claims successful fire spotters have “an indolent and melancholy nature,” and he should know. He spends long days gazing over the ridges, spotting smoke which heralds a cleansing clearing of dead brush, or a devastating hurricane of wind, smoke, and fire that eats all things manmade and natural in its path. There are only a handful of fire spotters left in our western states, paid $13/hour for the dry summer months, and Connors is one of them. He relishes his ten days on, four days off schedule from April to August, catching up on reading, thinking, writing, while he casts an eye out from a 55-foot tower above Apache Peak. He admits to a "perverse and loathsome envy" for those lookouts whose peaks are higher and more remote, and whose stories are better than his. He tells of famous forest fires and naturalists that changed U.S. Forest Service policy, first one way, and then another. He reminds us of Norman Maclean’s classic Young Men and Fire detailing the 1949 Mann Gulch Fire in Montana in which twelve smokejumpers were killed or fatally burned as the result of a poorly-understood “blowup.” He researches the jottings and writings of Jack Kerouac, fellow lookout from years before, and muses on his own solitary path and the love of a woman willing to grant him the freedom to be on his own. As long as the job exists, someone has to do it. But I couldn’t help feeling there is a degree of self-indulgence for a man (or woman) in middle life to take the time to watch for fire. Isn’t it even more so for a young man, so full of energy and promise, to do the same? I believe in contemplation, learning one’s limits, taking time to think through one’s path and one’s purpose. But isn’t it even more sacred to give oneself time to do that and then use that knowledge to engage the world? I thought this as I listened to Sean Runnette read the Blackstone Audio edition of this book. But I came to challenge my own position at the end. In the fire off-season, the author is a copywriter for The Wall Street Journal. A jarring note is struck at the end of the book, when the author tells us of his experience on 9/11, at the time of the Twin Towers’ fall. Here a man, who watches for fires in the natural world, finds himself in an inferno most unnatural. It is a weird, dislocating juxtaposition, just as a plane striking the World Trade Center in New York was for people around the world. It leaves us unsettled again, just as we were at the time, for it brings home the arbitrariness of one’s location in the big scheme of things, and makes us think that watching for fires is not so indulgent after all. This book was published in 2011, right about the time the devastating fires began which eventually engulfed Connors' section of the Gila National Forest, and burned nearly one million acres in Arizona and New Mexico. Final note: Fire spotters work in Canada as well, and Alberta is rebuilding fifty lookout shacks: article in the Vancouver Sun dated August 2011. Imagine for a moment Sir Arthur Conan Doyle had decided to set his Sherlock Holmes mysteries in Japan. Now imagine the time is not the late 19th century, but the middle of the 20th century, right after the devastation of World War II. Takagi Akimitsu (1920-1995) published this, his first novel, to great acclaim in 1948 Tokyo. Translated into English for the first time in 1999 by Deborah Boehm and published by Soho Crime, this translation bridges the half century since the novel was first published and gives us a fresh locked room mystery in a country where full body tattoos reach the status of art. When parts of a dismembered body are found in a room locked from the inside, Kenzo Matsushita, 29-year-old former military medic, contacts his older brother, Detective Chief Inspector Daiyu Matsushita to investigate the case. Kyosuke Kamizu, nicknamed “boy genius” and schoolmate of Kenzo from Toyko University Medical School, is enlisted to help solve the case. Kenzo is Doc Watson to Kyosuke’s Sherlock Holmes. Most entrancing in this mystery, perhaps, is the culture that surrounds art tattoos. The locked room is of course a mind-bender. Additionally, one cannot help but be drawn to the enigmatic, self-contained, and suave Kyosuke. Sherlock is the absolute yardstick and measure Takagi means us to use. All this is overlaid with a gauzy screen of Japanese culture and habits. It is fascinating: oriental, yet the best Sherlock impersonation I have met. Takagi won the Japan Mystery Writers Award in 1950 for his second mystery called The Noh Mask Murder Case. However, to my knowledge, only The Informer (1965), a mystery based on a true stock market scam, and Honeymoon to Nowhere (1965) have been translated into English, all by Soho Crime. A note for the publisher: the digital file for this downloaded book had extensive errors in spelling, grammar, and punctuation. Small mistakes like those found in advance galleys can be accommodated, but the mistakes in this efile actually made it difficult for me to understand what was going on. Since I paid full price for the book, it stands to reason I would like a product that is not defective. Digital files produced by different vendors have different outcomes, and this one definitely needed massaging. Hope you have better luck with efile oversight in the future. "He stood for some minutes before the gate with all the patience of a lover waiting for the appearance of his beloved. But he was waiting for no one. He was no lover in the worldly sense; the only love he knew was that of divine understanding, of taking a whole life into his arms, stripping it of flesh and bone, and feeling into its depths as if they were his own. 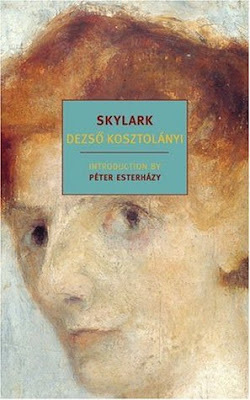 From this, the greatest pain, the greatest happiness is born; the hope that we too will one day be understood, strangers will accept our words, our lives, as if they were their own..."
Set in Hungary at the turn of the twentieth century, Skylark is the story of a family: father, mother, and daughter. They live together in the family home on a ramshackle street in a provincial town. The father feels old, and plans for his death, often fussing over the placement of his will and papers so that they are easy for his wife and daughter to find. The mother leaves household management to her daughter, dismissing the maid because she could not do as well as the daughter. She had loved playing the piano once but locked it away and out of their lives when her daughter did not take to it. His daughter, Skylark, is no longer young, and not at all pretty. She had gotten her name years ago, "many, many years ago, when she still sang." The three of them love each other, and live quietly with only themselves for company. When Skylark goes away for a week to visit country cousins, the parents are unmoored, at first. But soon they experience a giddy sense of freedom from constraint. "For yes, at first sight [the other townspeople] seemed worthless, twisted and distored, their souls curling inwards. They had no tragedy, for how could a tragedy begin to grow in such a wasteland? Yet how profound, how human they all were. How much like him. Once this became clear it could never be forgtten. So he did have something in common with them, after all." The deep home-truths revealed in this novel involve all of us, especially those of us who have ever felt a sense of freedom and release simultaneously with fear and distress when a loved one leaves us home alone. Several of the quilts featured in this book stopped me in my tracks. The book also helped me remember that I have a bevy of sewing sisters who never feel they have the time to take on a big quilting project, but like the idea of having a quilt of their own. Sending around a pattern, plan, and scraps of fabric to a group of people and asking them to make two or three blocks takes the pain out of making a quilt top. Many of the quilts featured in this book have large patches of solid fabric, which showcase the great choices of patterned fabric. I always knew simpler designs calm me and don't grow tiresome, but usually it is fabric, rather than design, that gets my creative juices flowing. Not in this case. You will also be able to use fabric scraps from your stash in many of the designs. So, give this book a whirl--it will definitely spark some desire to be involved in a virtual quilting bee. Choose a design and specify a finished size for the blocks. Then the coordinator for a quilt sends fabric pieces out to the group, and your group sends back the blocks. The coordinator puts it all together creatively, quilts it up and voilà! You have a quilt with far less effort and with the individual creative sparks your group adds. Of course, then you help everyone else with their designs...so everyone learns as they go, without stress. Many of the women participating in collating this book have websites which are sure to make your life interesting. Check out a few: Philistine Made; Film in the Fridge; Unraveled; Looking In. Who wants to start a quilting circle? Whatever else we can say about James Hamilton-Paterson, he is a very funny man. If you ever found yourself in the Italian countryside gazing at the villa next door and wondering who lives there and who, for gosh sakes, is coptering in and out, after reading this novel, you may very well decide you don’t really want to know. It may be entangling, and may, after all, be the end of all you hold dear. Gerald Samper, British biographer to the rich and famous, buys an old villa in need of repair in Tuscany’s Apuan Alps region. He is told, as is his nearby neighbor, that the owner of the nearby villa is rarely in residence so his quest for privacy and solitude is guaranteed. Of course, nothing could be farther from the truth. In fact, the resident of the villa he can see from his own is none other than a well-to-do refugee from a Soviet republic, with all her entangling connections. But this book is not about cooking, despite the title. It is about living the good life in Tuscany among other artists—writers, musicians, filmmakers, realtors--magicians of all stripes. And what of Fernet Branca? It is a digestif concocted in Italy that, given as a gift to the new arrivals of Le Roccie, is purchased a second time to return the courtesy, and becomes a central feature of the misunderstandings among the residents and visitors there. It is described in Wikipedia as having the flavor of “black-licorice-flavored Listerine." Long before I started recording the books I’d read and writing reviews, I read my first Deon Meyer novel called Heart of the Hunter. It was a tremendous introduction to South African fiction—rich with characters strong and brave, written with such specific local color, one could be nowhere else on earth. I now grab Meyer’s new books whenever a bookstore is wise enough to stock them, and recommend them to anyone who likes international mystery fiction. In this latest offering, Meyers takes on a plot thick with international terrorism, diamond and animal smuggling, and gang warfare. He reprises or invokes old faces: private investigator Mat Joubert; “retired” bad boy and private security bodyguard Lemmer; Lukas Becker, archeologist and bruiser with a heart of gold; Benny Griessel, policeman extraordinaire. We are introduced to a new character that we hope to see again: Cornelia Johanna van Jaarsveld, better known as the animal tracker, “Flea.” It is a lot to assimilate, but Meyer manages. The final third of the book is riveting, and exhibits Meyer’s great skill: writing a fast-paced story unique with characters that matter to us. This big book is almost an embarrassment of riches: many threads, stories within stories, lots of characters. It could have been three separate novels, though they all tied together at the end. In my ebook version, the first one hundred pages “set the scene” for an international terrorism plot, but do not display Meyer’s great skills at characterization. The reader must not lose hope, because the rest of the book is hallmark Meyer. I perhaps would have encouraged greater editing on the background terror plot, while I understand the reason for it. It was, perhaps, more detailed than necessary and certainly less interesting. It would have taken some effort to shorten the plot explication while highlighting Milla, the character who later plays a pivotal role. In any case, far be it from me to withhold praise from Deon Meyer, who can be masterful in sharing South Africa with us. As an added bonus, Meyer’s website has photographs posted by the author that show the locales he describes in the book, titled Spoor in the Afrikaans edition. In case you’ve never been to South Africa, this is a good opportunity to visualize the landscape Meyer describes in his novels.